Although many enthusiasts prefer the satisfaction of building their own PC, there's still a solid market for pre-fabbed gaming machines. Asus and a handful of other companies seem to understand this. 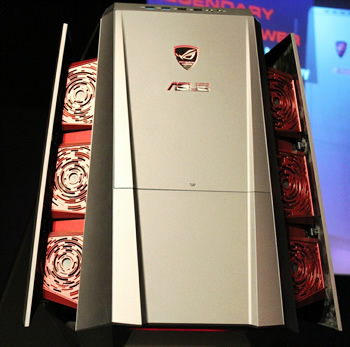 However, Asus thinks they have an irresistible feature that sets their beastly PC apart from the competition: it transforms itself into a halfway-open, innards-rearing, overdriven gaming rig at the push of a button. The Asus ROG Tytan CG8890 -- a rig for gamers who know it's what's on the inside that counts -- admittedly looks pretty nice on the outside too. However, when users push that "Turbo Gear" button though, its side and top panels magically lift to partially reveal its glowing insides: a bevy of mesmerizing, LED-lit fans and an impressive liquid cooling system. When the system is operating in Turbo Gear mode, the PC is overclocked between 3.8GHz to 4.2GHz, depending on the user's choice. Although the somewhat zany transformation feature adds a fun sense of novelty to this gaming machine, don't let its gimmicky selling point fool you. Inside, the system features an Intel Core i7-3960X, GeForce GTX 690, 16GB of RAM, 2 x 128GB SSDs in RAID-0 plus a 2TB 7200 HDD and an Asus Xonar DX sound card. Although a price hasn't been announced, it's a safe bet the radical Tytan ROG will be as expensive as you're thinking (perhaps even more so). SSDs, liquid cooling, GeForce GTX 690 and a custom case which features special "transformative powers" will likely come at a substantial premium.